BSNL has announced the launch Unlimited 3G/2G Data STVs for its Prepaid Mobile Customers. 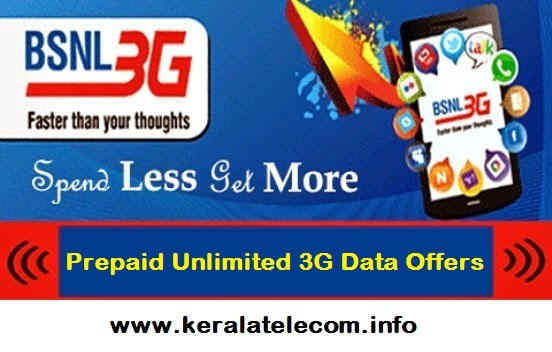 As per the latest information, Prepaid Unlimited 3G/2G Data Packs will be available for all BSNL prepaid mobile customers in South and North Zones. The newly announced BSNL prepaid unlimited 3G data offers will be available from 27th August 2015 onwards. BSNL will be launching three different types of Unlimited 3G data STVs whose MRP starts from Rs 399 onwards. Earlier in April 2015, BSNL launched Prepaid Unlimited 3G Data offers for customers in Haryana and Himachal Pradesh Circles. Now as per the latest information, those STVs will also be withdrawn from 27-08-2015 onwards. Dear readers, please share your views and opinions about these new Prepaid Unlimited 3G Data Offers from BSNL via comments with us. Is this offer available yet? ? Just called bsnl customer care & they don't know about any unlimited data stv.. I wish, it will available for east zone- odisha also.